Fresh from their sold-out, five-star run at the Edinburgh Fringe, join multi-award-winning duo, Zak Ghazi-Torbati & Toby Marlow (co-writer of SIX), for the cabaret comedy extravaGAYnza that well and truly SLEIGHS. 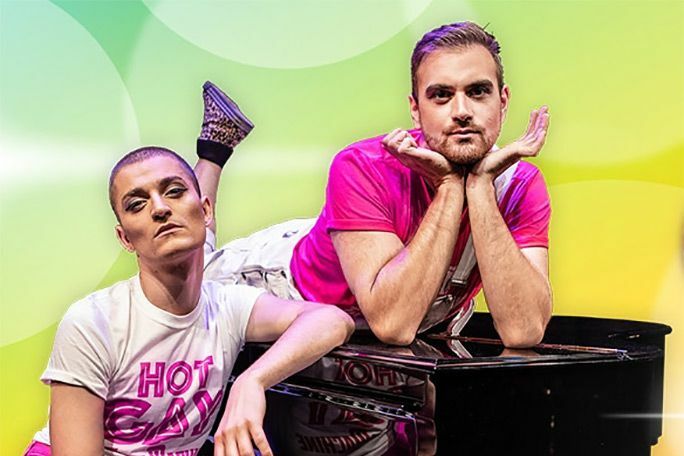 Full to the brim with aggressively enthusiastic dance routines and ‘hilarious original musical numbers’ (The Stage), Hot Gay Time Machine has all the ingredients for the perfect festive night on the town. Just like A Christmas Carol - but with fewer ghosts and more gays - the dynamic double-act sing, shimmy and sashay the audience on a time travelling adventure through the history of their favourite topic: themselves. Covering all the most important moments in a gay man’s life, like coming out to your mum and navigating the naked politics of the school locker room, this is a Christmas party like no other. It’s been described as ‘riotous, but subtly moving’ (The List), though how anyone can call anything involving shorts this short ‘subtle’ is beyond us. You’ll come away with your sides aching and your heart full - and maybe Toby’s number if you’re lucky and handsome. Hot Gay Time Machine is not available to book, please sign up to our newsletter for updates and offers on forthcoming and available shows. Where is Trafalgar Studio Two?